In the wake of a shootout which leaves two officers dead, Deputy Kevin Kearns finds himself in the crosshairs of a departmental corruption probe and criminal investigation. His association with retired San Francisco Police Inspector Robert Farrell, a man with a well-earned reputation for playing by his own rules, isn’t doing him any favors with Internal Affairs or the District Attorney’s Office. Farrell knows his former partner is innocent, even if the D.A. and I.A. cops hounding him don’t. He also suspects whoever set Kearns up as the fall guy in the deadly ambush isn’t pleased the young deputy survived; and will try to correct that mistake. After two more attempts on Kearns’ life, including one which Farrell’s daughter Jennifer barely escapes, it becomes increasingly clear the lethal attacks are being directed by somebody within the department. Someone wearing a badge. Kevin Kearns and his law enforcement veteran buddy Robert Farrell fight murderous crime that edges too close to home for Kearns—literally—and they must solve the case before Kearns loses his badge and people close to him. 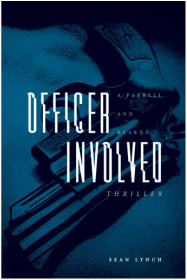 Officer Involved is the third book in the Farrell and Kearns Trilogy. Keeping it real and gritty, Sean Lynch transcends hard boiled crime, Western, and horror genres. Sometimes rules were made to be broken. Hard.